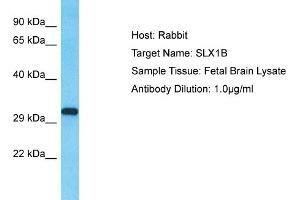 Characteristics This is a rabbit polyclonal antibody against SLX1B. It was validated on Western Blot. Background This gene encodes a protein that is an important regulator of genome stability. The protein represents the catalytic subunit of the SLX1-SLX4 structure-specific endonuclease, which can resolve DNA secondary structures that are formed during repair and recombination processes. Two identical copies of this gene are located on the p arm of chromosome 16 due to a segmental duplication, this record represents the more telomeric copy. Alternative splicing results in multiple transcript variants. Read-through transcription also occurs between this gene and the downstream SULT1A4 (sulfotransferase family, cytosolic, 1A, phenol-preferring, member 4) gene.